Schools will be out soon as the official first day of summer is just around the corner. Many of you are busy making plans for travel, arranging summer activities for the kids, and hoping June “gloom” won’t be too long so that it will be worth going to the beach or to the San Diego County Fair at the Del Mar Fairgrounds. Speaking of the Fair, those are the Doyle kindergarten children featured on some of our street banners. I hope to see many of you at the Standley Park 4th of July “Celebration”. It will be as always a fun-filled day full of exciting activities, booths, (and snow slides for our ten and under children), ending with a great evening band concert. On Thursday, June 21, 6:00-8:00pm, at Standley Recreation Center, there will be an important Park and Recreation community meeting focused on the new Recreation Council organizational structure. Future plans for our park improvements at Doyle, Marcy, and the “ImagineUC 2020” will also be discussed. UCCA is very hopeful it will be a recipient of a San Diego County Community Enhancement Grant next month. We have asked for funds to provide all-color monthly newsletters for one year, plus money to initiate monthly “podcasts” to better inform our community about major issues affecting our quality of life. Please plan to attend our June 13 meeting community meeting at the Library on Governor Drive at 6 PM. We welcome your participation. Remember, it’s because of volunteers and residents like you that University City is “more than just a neighborhood”. Addendum: After the June newsletter went to press, UCCA received notice that councilmember Barbara Bry is seeking residents to serve on the Pure Water Working Group. The purpose of the Working Group, among other tasks, is to ensure the community concerns regarding the construction of the pipelines are identified and understood by the City; and to propose ways to avoid, minimize, or mitigate concerns associated with the construction. 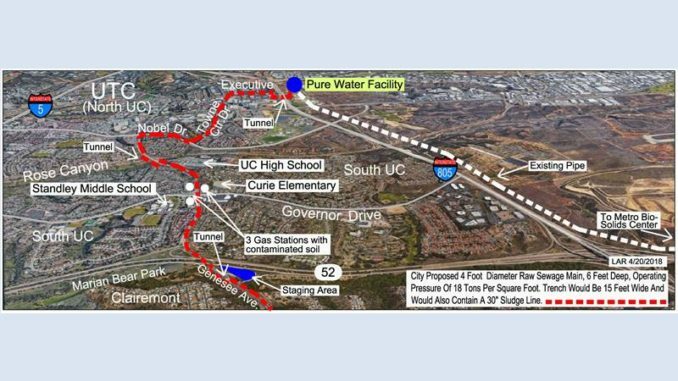 University City residents who wish to serve on the Pure Water Working Group should contact University City Council Representative Bridger Langfur no later than Friday, June 8. Bridger can be reached at blangfur@sandiego.gov or 619-236-6611.